"The ridge isn't this monolithic thing—it has two distinct sections, each of which has a variety of colors," Vasavada said. "Some are visible to the eye and even more show up when we look in near-infrared, just beyond what our eyes can see. Some seem related to how hard the rocks are." "The best way to discover why these rocks are so hard is to drill them into a powder for the rover's two internal laboratories. Analyzing them might reveal what's acting as "cement" in the ridge, enabling it to stand despite wind erosion. Most likely, Vasavada said, groundwater flowing through the ridge in the ancient past had a role in strengthening it, perhaps acting as plumbing to distribute this wind-proofing "cement."" Haematite is the mineral form of Iron Oxide. Haematite is harder than pure iron, but much more brittle. "The best way to discover why these rocks are so hard"
Yeah - who cares? The rover has been driving around in circles, wearing out its wheels, for months. The interesting stuff is farther up the mountain. The fossils are up THERE. You can do all the mundane geology you want back here on earth. Fossils? You actually think that multi-cellular life has ever existed on Mars? I believe its entirely possible that bacteria or the like have and even potentially still exist on Mars, but Prokaryotic is infinitely less complex than the multi-cellar form capable of leaving actual fossils. 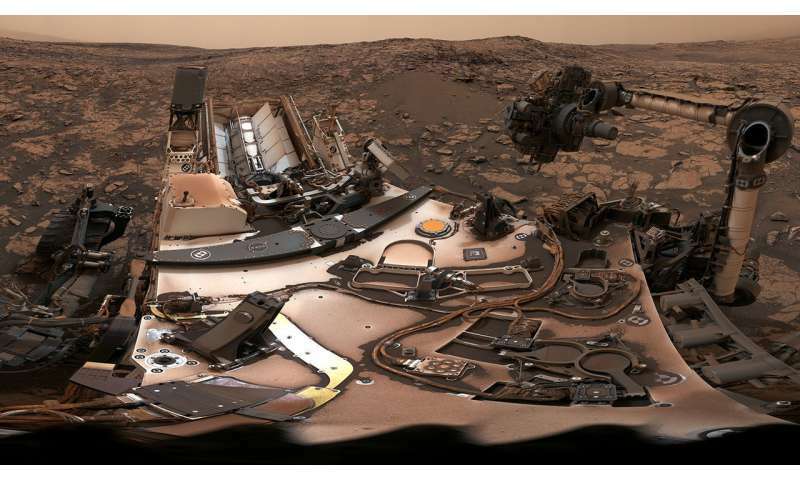 "In a new paper published in the Journal of Geophysical Research: Planets, Sean McMahon from Yale University and colleagues present a "field guide" for scientists engaged in the search for putative fossils on Mars. The authors believe the best place to look for fossils would be in mudstones rich in silica and iron-bearing clays that formed in the ancient lakes and rivers of Mars. Microbial life could also have been preserved in silica or calcite-rich hot spring deposits—although these have yet to be found on Mars—and possibly in salt rocks." -And it of course doesnt need to be multicellular. "Most of us associate fossils on Earth with the hard remains of shellfish or even bones. But because evolution on Mars most likely stopped with microbial, or at least small, organisms, and did not advance to complex life forms, finding the right environmental conditions for preserving soft bodies is a much more challenging problem." How come you didnt know this? I mean, they find them here on earth right? "Scientists have found fossil evidence of ancient microbial communities that lived 3.5 billion years ago. "The new fossils, described in the journal Astrobiology, may be among the most ancient fossil life forms ever found. "This is one of the, or the, oldest fossils ever found. You've got a 3.5-billion-year-old ecosystem," said study co-author Robert Hazen, an earth scientist at the Carnegie Institution for Science in Washington, D.C."
Going to need boots on the ground, or one hell of a rover. No way is Curiosity equipped to find microfossils. "A few stromatolites, or domelike like rock structures built by ancient microbial communities, have been found at the Strelley Pool formation in Australia that may date to about 3.45 billion years ago. Fossil sulfur-eating microbes from about 3.4 billion years ago have also been found there as well. Other fossils from South Africa reveal microbial communities that date to 2.9 billion years ago." -And yes, we might even find bones or at least shells of some sort. Those wheels are going fast. The higher up the mountain, the more advanced the potential lifeforms. All we need is pics. The following gold rush will be breathtaking. True, and I hope such a thing happens. It won't be definitive though. Given what I've read about the preparation of samples on Earth, including slicing the rock into thin layers, I'd still rather have boots on the ground. Better still might be a sample return mission if we find something that looks very promising. Remember the hoohaa over ALH-84001?